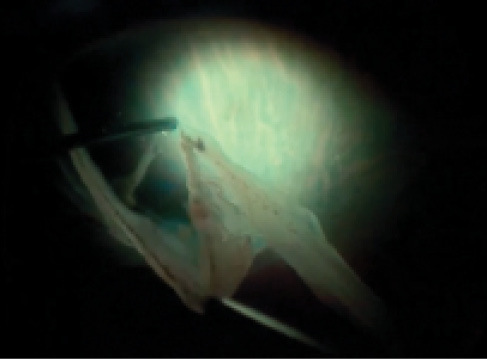 María H. Berrocal, MD, presents a case of a 76-year-old male who had undergone surgery for a traumatic giant retinal tear, cataracts, dislocated lens, and hyphema. He detached again under oil 2 months later. I love this video for many reasons, the first of which is that María H. Berrocal, MD, demonstrates perfect technique during each step of this surgery. Novice and seasoned surgeons alike should take note of this 3D surgical video. Giant retinal tears are uncommon, and most surgeons hope they encounter only a handful of such cases each year. Use of perfluorocarbon liquid tamponade and small-gauge vitrectomy generally yields positive results. Still, given the large number of retinal pigment epithelial cells exposed in the presence of a giant retinal tear, proliferative vitreoretinopathy (PVR) more commonly occurs. It should be unsurprising, then, that the cause of redetachment in Dr. Berrocal’s case is subretinal PVR. The patient in this case had an extensive 12-clock hour giant tear, providing the surgeon access to the subretinal space. Eyes in which smaller tears are present may require a focal retinotomy to allow removal of subretinal membranes. I often start with Maxgrip forceps (Alcon) rather than Eckhardt forceps; the former provide superior engagement of subretinal membranes. Dr. Berrocal used her light pipe as a second instrument to provide countertraction, obviating the need for a bimanual technique with a chandelier or a second lighted instrument. As Dr. Berrocal’s Eyetube video demonstrates, the cutter alone can serve as a useful multifunctional tool during subretinal membrane removal. Using it in this way is both cost-effective and efficient. Small-gauge cutters have seen increased use in cases of complex diabetic vitrectomy. Will they become similarly popular for PVR membranectomy? • A giant retina tear, 12 clock hours wide, was repaired on a heads-up 3D viewing platform. • A large macular hole was managed using free ILM flap insertion into the hole, providing a scaffolding on which healthy tissue could grow. After the membranes were removed, perfluorocarbon was applied and the retina flattened. Retinopexy was performed via continuous laser to the edge of the retinectomy. 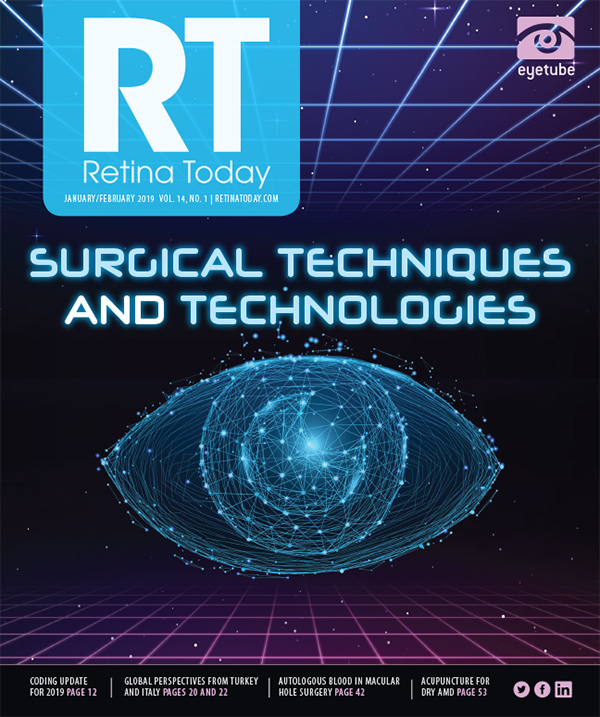 Although continuous laser occupies a controversial space in retina, some of its characteristics are clear: It is efficient, it allows cauterization of residual areas of bleeding at the retinectomy edge, and it conserves precious retinal real estate. The inferior peripheral iridotomy, performed via an anterior approach, was made sufficiently large to limit the chance of closure during postoperative inflammation. Some surgeons may choose to perform two smaller inferior peripheral iridotomies to prevent postoperative pupillary block. Hudson de Carvalho Nakamura, MD, presents a technique designed for large macular holes where the ILM is folded and inserted inside the macular hole to create a scaffold that encourages hole closure. A large macular hole is typically greater than 400 µm on spectral domain OCT. Will you tell your patient to remain facedown for an extended period of time to increase the chance of closure? Or will you consider a more modern approach, such as that demonstrated in this case by Hudson de Carvalho Nakamura, MD? 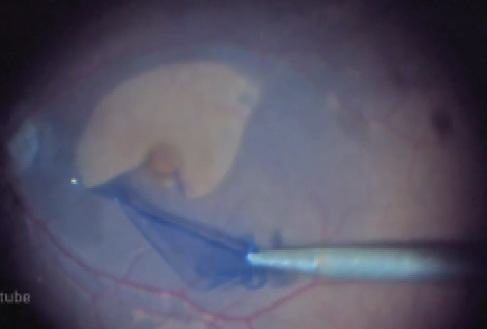 The idea of using an internal limiting membrane (ILM) flap during macular hole surgery is not new, but this video demonstrates a modified approach to this important surgical technique. The surgeon in this case chose to use a free ILM flap. Using closed forceps, Dr. Nakamura placed a free ILM flap into the macular hole and stuffed the remaining edges into the macular hole with the closed forceps. During this maneuver, the membrane curled into itself, creating a tube that could be easily packed into the macular hole. This type of placement and manipulation allows the ILM free flap to remain very secure under fluid and during fluid-air exchange. Care must be taken not to damage the underlying retinal pigment epithelium during manipulation of the flap with closed forceps. Some surgeons prefer to use a temporal ILM flap in surgery for a large macular hole. A temporal ILM flap can be secured with OVD or coaxed into position by tilting the eye nasally during fluid-air exchange. It should be noted that a temporal ILM flap could be amputated or could be lost during manipulation or fluid air exchange. The free-flap technique used in Dr. Nakamura’s case is an alternative approach that may be necessary if a temporal an ILM flap is unable to be fashioned or gets lost during creation and positioning. Temporal ILM flaps provide smooth scaffolding on which other cells may grow. Free flaps may just fill the gap without offering a properly oriented scaffold to allow restoration of the outer retina during macular hole closure. The flap over ILM flaps continues. What is not debatable is that doctor and patient alike feel better if the hole is closed, as it was in this case.